We are natives of Pennsylvania & when we get back to visit our parents we try to take the kids somewhere special for a day. These are some of the places we've been. 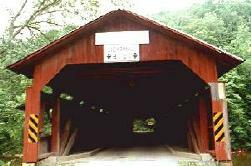 More info on Pennsylvania State Parks. 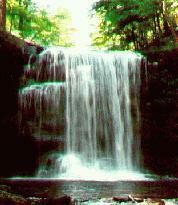 The Glens Natural Area is a Y-shaped gorge made by two branches of Kitchen Creek. The elevation drop is 1,000 feet in 2 1/4 miles. There are 22 named waterfalls along the 4.5-mile Y-shaped trail and dozens of smaller, anonymous cascades. The trail follows Ganoga Glen and Glen Leigh gorges. Waters Meet is where the two branches of the creek come together and there are three falls downstream. One of these falls is popular with teens on hot days. Glen Leigh is the steeper of the two gorges, but overall I rate the trail moderate. 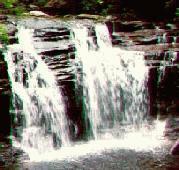 Many of the steep steps along waterfalls are made of cut logs and can be slippery with spray. Several of the bridges are made from felled trees, which give them a natural look, but allow for passage by only one person at a time. As whenever hiking, wear appropriate footwear - hiking boots are best. Click here for more of my pictures Warning: Graphic intensive! Click above to go to Knoebol's home page, here for more of my pictures. Elysburg PA. Free admission (so you can take Grandma along) and lots of picnic tables for the picnic lunch she packs for you. Free parking, too. Camping sites available nearby. Pay per ride or hand stamp/wrist band for unlimited rides. 1997 prices are $17 for adults ($20 includes the Phoenix). Waterslides and swimming pool also available, admission extra. One of the oldest carousels and one of the last wooden roller coasters are here. Some say the Phoenix is the best roller coaster, wooden or not. Being a wimp, I wouldn't know! The Grand Carousel is more my speed. The Forksville Area is home to at least two covered brdges.... these pictures are of one. All persons are forbidden to ride or lead any animal over this bridge faster than a walk or to drive more than 15 head of cattle horses or mules thereon at one time or to carry fire thereon except in a safe vessel under penalty of not less than $ .30 for each offence." My kids looking out the bridge window. Blooms in early June. It is illegal to pick the blooms. If you haven't already guessed, the background image on this page is mountain laurel.